Gift Plan is a planning app that organizes potential gift ideas for your family, friends, or coworkers for any possible occasion. The developers, Glasshouse Apps Pty Ltd., released Gift Plan just in time for the holiday season, lucky for us. It costs $1.99 and is compatible with an iPhone, iPod Touch, and iPad but requires iOS 4.0 or later. I am not sure how most people manage gift giving, but I like to brainstorm in advance and come up with multiple gift ideas, eventually narrowing the list down to the cheapest and most practical option. Gift Plan allows you to add any number of people manually, or by importing birthdays from your Contacts or Facebook. Once you have a list of potential giftees stored in the app you can modify and personalize each one by attaching occasions and corresponding dates. The occasions already saved into the app are Birthdays, Christmas, and Anniversaries, but you can add and delete the types of occasions in the preferences section. 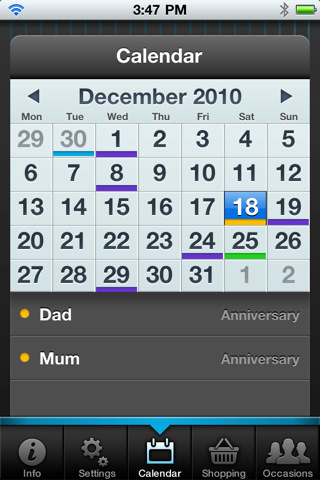 Adding occasions includes the option to color code so that each occasion has a separate identity in the master calendar. 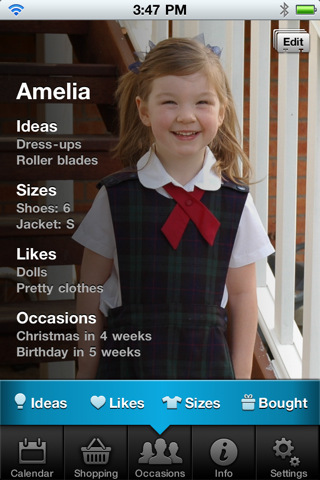 Another way to customize people’s profiles is to add to the subsections of Gift Ideas, Likes, Sizes, and Items Bought. In the Ideas section you can play around with thoughts and prices of prospective presents. When you start adding to the list the prices get tallied up for you so that you can get a better idea of how many items you want to buy and what you can afford. Another feature offered is a countdown so that when you get into a profile you can immediately see how many days you have left before it is time to wrap it up and give it out. The master Shopping List, which includes everything you have put down as gift ideas for everybody, the prices, and how many days are left before the occasion, also includes boxes to check for gifts you have purchased. Gift Plan is a great way to plan a holiday, birthday, baby shower, anniversary or any other celebration, seamlessly. Almost all of my friends have Spring birthdays so using Gift Plan to help me visualize what I have already accomplished and what exactly needs to be done is a must. AppSafari review of Gift Plan was written by Vanessa Paszterko on December 13th, 2010 and categorized under App Store, Calendar, Featured, Productivity, Social. Page viewed 3694 times, 1 so far today. Need help on using these apps? Please read the Help Page.